and participated in two sea voyages. His discoveries and research contributed greatly to his fundamental work Physical Description of New South Wales and Van Diemen's Land. But his most spectacular achievement in this region, which fascinates people even today, is associated with a little known but quite large and beautiful island east of Tasmania called Flinders Island. On it, there are imposing Strzelecki's Peaks and a small but very impressive Strzelecki's Peaks National Park. 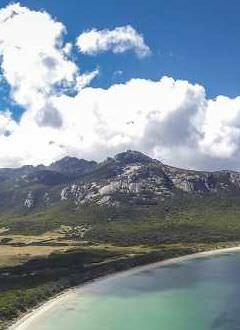 The Peaks dominate the Flinders Island, and although this 140,000 hectares Island has a lot of wonders of nature like massive mountain ranges, isolated granite peaks, splendid rocky capes and deserted beaches, the 4200 hectares of Strzelecki's Peaks are the landmark. One can see them from nearly every point on the Island. Strzelecki's Peaks mark the skyline of most of the Furneaux Group 60 islands. Usual westerly winds lift ocean moisture to the tops, which are often covered, in clouds. When they are not, and you are at the top, you can see a wild mountainous country with many islands in the background, the largest called Tasmania. the first, what are the marvels of the island and particularly this mountain range? the third, how the Polish community in Australia can contribute to promotion of Strzelecki's Peaks National Park as a tourist destination and to a better understanding of Strzelecki's role in exploration of Australia. After a long drive from Brisbane to Traralgon in La Trobe, with my son we boarded an eight seated and flew to Whitemark, the capital of Flinders Island. The town has 100 inhabitants and about a quarter of the population came to be told about the Polish mountains. My intention was to answer a question put by myself: why did Strzelecki climb mountains? The answer was: because the Polish mountains are beautiful. They cover only 3% of Poland but it is where 50% of tourist traffic concentrates. Polish people simply love mountains and Strzelecki was no exception. He was the first one to climb Mt Kosciuszko and name it after the greatest Polish hero. The local population was interested not only in Strzelecki but also in Kosciuszko, particularly in the fact that the both Polish heroes at different times eloped with girls, got caught and had to leave their country. I explained that eloping was the Polish national sport because we didn't have cricket. It was amazing to find that on such sparsely populated island (600 people in total) a group of bushwalkers interested in Strzelecki climbed the Peaks on 20 July 1996 to celebrate the 200 anniversary of Strzelecki's birth. Even more, it wasn't an ordinary celebration. It was a real Polish celebration at the top with a bottle of Polish vodka. Most of it was poured into proper places but a few drops were left intentionally on the rock. In preparing such program there was not even one Polish person involved. All local islanders only. My first field experience was with Irene, the owner of Whitemark Cottage and 4WD driver. She took us to the north-west part of the Island where Mount Killiecrankie and Old Man's Hat separate stretches of deserted beaches from non-populated ranges of hills. Mt. Killiecrankie is one of the best climbing areas in Tasmania, although sporadically visited. There are unusual rock formations above the head and even more fantastic in water. Plenty of flowers everywhere and only us. Nobody else. After a couple of hours, from the point which can be reached by 4WD, deeply in the bush, a simple structure with a plastic roof is found. Inside, plenty of books, mostly on the philosophy of the east. One can sit and read, use a kettle and make tea. The owner converted into Hindu, lived here alone and left many years ago. He may come back tomorrow or after three years. When it happens he will find his dwellings left intact by people and affected only by rain, sun and wind. There are many similar places on Flinders and other islands. People left their houses but may come back. The nature takes its possessions back. You may open an oven and find a deadly snake. In a drawer a mouse organised its nest. In a shed you can see a motorbike not used for the last ten years. In another one only birds are living now. The next day, Chris, the National Park ranger, drove us early morning to Lady Barron wharf where a small catamaran waited for a research party to examine population of mutton birds living in burrows on small outer islands. It is a very unusual bird. If flies around Pacific, feeds close to Aleutian Islands on plankton and comes to Bass Strait to lay one egg in a borrow. It has been calculated that this bird flies in its life further than from Earth to Moon and back. Hunters and poachers killed millions of mutton birds on Flinders Island and around. Now the industry is controlled, some of the islands are protected. There are also beautiful Cape Barren Geese living on the islands. One of those we visited was Big Green whose geographical location was corrected by Strzelecki during his trip. I guess it wasn't hard for the experienced surveyor to take as many instruments as possible to the beach and spend a night measuring stars' positions. During a day it was even easier to measure various directions and vertical angles, particularly towards Strzelecki's Peaks. Hundred and sixty years ago there was a huge difference in the degree of difficulties met by an explorer attempting to find geographical positions and heights of Mt. Kosciuszko and Strzelecki's Peaks. Mt. Kosciuszko is hardly visible from the lowlands. The „high country” is flat and it is very difficult to identify the highest point from a distance. An impossible task from Geehy Valley and Murray River. If Strzelecki wanted to transfer coordinates from accurately established points at the footsteps of the Snowy Mountains he would have to build the whole network of points - a mammoth task. He did the only logical thing he could. He carried all the heavy equipment on his back to the summit just to make sure that he was at the highest top, measure the height and the sun's position for calculating latitude and longitude. It is much more accurate to get geographical coordinates through measuring stars' than sun's positions. Strzelecki did not stay overnight on Mount Kosciuszko. He must had used sun for his survey and that's why his results were not accurate. In Furneaux Group area he was in a very different position. He had time, means of transport and he did not have to carry heavy stuff on his back. What for? His task was to check locations of numerous islands and he could do it by measuring directly stars' positions or by transferring coordinates from already precisely fixed points. He could find all necessary topographical elements of Strzelecki's' Peaks without going to the top. Even more, moving around the mountain range he could do it much more precisely and he could also check his results in various geometrical combinations. If he had the appropriate mathematical knowledge he could even „upgrade” the results of his measurements without going to the tops. So, the question is: why did he climb Strzelecki's Peaks? From what we know about him it doesn't appear that he intended to have a nice bushwalk only. He must have had another purpose. Did he want to make a geological survey? Did he want to collect some species? He earned money by collecting natural samples and selling them to the museum in England. It is interesting whether there are any samples from Flinders Island in London. How old are they? Were they sent or brought by Strzelecki? Which way did he go to the top? Today's tourist trail starts over the fence, leads to a registration booth, turns to the left (orographical) side of a creek, climbs gently and turns to the right side. Zigzagging elevates a tourist to a small grassy platform with a beautiful view, skirts the vertical wall of Strzelecki, and brings to the north summit from behind. It is possible to descent south and walk to the south peak, which is about hundred meters away. Vegetation is very dense, there is no one constant direction and without the trail it would be very hard to find a way to the top. Could Strzelecki walk this way? Very unlikely, for any mountaineer the logical way appears by the north-west ridge. Also, the vegetation is very thick now but it wasn't before. People on the island talk about a huge fire that took place one hundred years ago. It destroyed the original, old eucalyptus forest. We can assume that during Strzelecki's trip the bush in this area was more friendly than it is now. ← ← two vertices of the same summit, vertex characteristic, because looking like two nearly identical head rock next to each other on the same level. After our climb we were taken by plane around Strzelecki's Peaks. It was late afternoon, nearly sunset, and again we could see this unusual massive decorating the island. It is wilderness. Only one trail leads inside it but there are at least three large valleys with creeks (one is called Big River) and a few ridges challenging experienced bushwalkers. To tackle the main ridge with Mt. Razorback it takes at least two days for an experienced party. Opportunities for adventurous bushwalkers are countless and we are talking only about a small fraction of this incredible island. During my meeting with locals I presented slides from Tatry and Beskid Niski / Bieszczady. 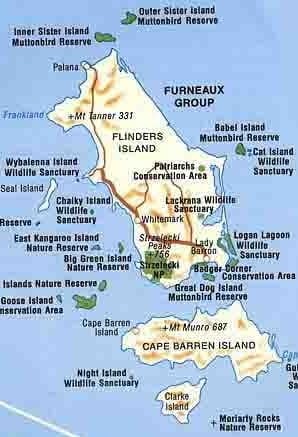 After a few days I found that there were similarities between Flinders Island and the latter. Both areas were deserted at one stage and both were subjects of failed experiments. In Bieszczady, after 1950, the Polish government tried to cut all timber in pristine forests, to settle new farmers in conditions resembling 18th century, to keep prisoners in special camps (Gulag Archipelago) and among them locate camps for 100 000 scouts. All those experiments failed. On Flinders Island the first experiment was to kill all the seals. It was successful. To the west there is 1600 hectares Prime Seal Island. There is not even one seal left. Only the name. After the seals were converted into oil and furs the mutton-bird harvesting came. There were millions of mutton birds. There are still some left. 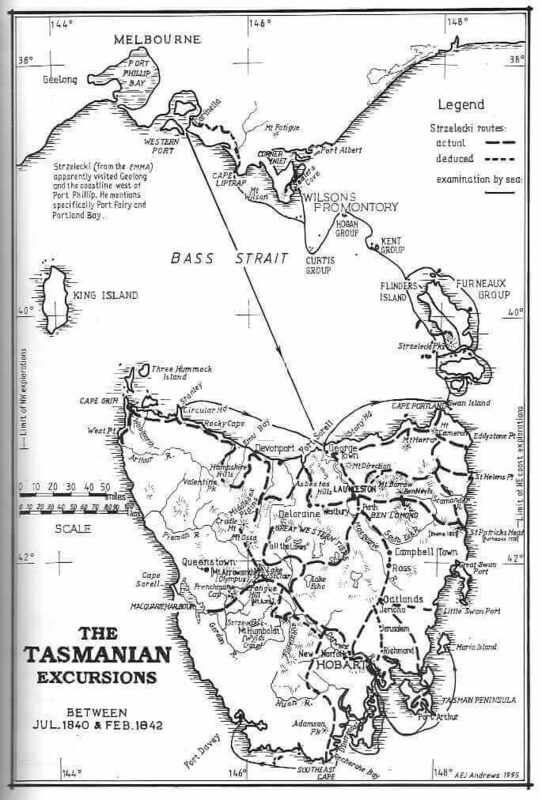 In1833 the Tasmanian aborigines who survived „the final solution” in Tasmania were transferred to Flinders Island to start a new life as good Christians. Three quarters of them perished quickly and the rest were transferred somewhere else where all of them died. In 1886-87 John Brown who was looking for timber and agricultural area surveyed the whole island. He took the opportunity and tried to change name of Strzelecki's Peaks into Franklin Range. The proof hangs on the wall in Emita Museum on the island. After the Second War the government decided to settle returning soldiers here. Each of them got 100 hectares and a house but only a few were farmers and most sold their leases. Today the island is not progressing. The population is in decline. The unemployment is high. There are more beds available than visitors. Camping grounds are empty. People living on the island need a stimulator and they believe Strzelecki and the Polish community may help. On the 13th of March they plan a group climbing to the top, to celebrate the first ascent. In Emita museum there are articles about Strzelecki in Polish. They would be very happy and helpful if the Polish community marked its presence and interest on the island. I strongly believe that it would be very beneficial for the Polish community in Australia to allocate some time and work towards „polish incensing” of Flinders Island. It is a very beautiful, little known island, which has a very strong Polish connection. It can be promoted among members of the Polish community as an excellent tourist destination and for those who retire with some capital - a perfect retirement village. Some Polish scientists could devote a fraction of their energy and undertake various research programs, mostly relating to history, nature and tourism. Scouts could have a wonderful vacation camp e.g. at Trousers Point, at the footsteps of Strzelecki's Peaks. They could survey villagers and record their memoirs. Sea wolves could participate in the existing competition involving sailing on yachts and climbing three mountains: Mt. Wellington, Mt. Graham (Freycinet Peninsula) and Strzelecki Peak. Everybody could participate in the historical climb of Strzelecki Peak on 13 March each year as well as on 20 July. Our Polish media could promote these activities and the island as such. Going even further I would suggest a sort of agreement between a leading Polish organisation (possibly the Federation of Polish Organisations in Victoria) and the local council setting up the possible Polish contribution and local assistance. There are three special places in Australia closely associated with Strzelecki through his work, names and commonly accepted Polish participation, namely: Mt. Kosciuszko, Gippsland and Flinders Island. The Polish community contributed a lot in an intellectual and material sense to the first two. It is now time to take care of the third one. There is a very special feature of Strzelecki's Peaks National Park - flowers. There are no flowers in other mountain ranges on the island. Strzelecki Peaks have millions of them. More interesting is that most of them are everlasting daisies, very similar to those growing on the slopes of Mt. Kosciuszko. It was one of them sent by Strzelecki to Adyna Turno, as his word of „freedom, patriotism and love”. Click - read the full op-ed about Strzelecki National Park. 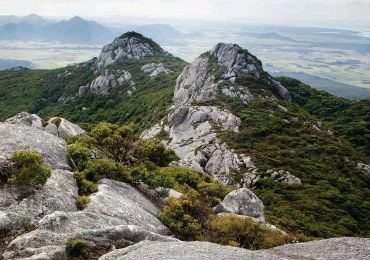 Strzelecki National Park was named in honour of the Polish scientist and explorer Count Paul Edmund Strzelecki, who climbed a number of the mountain peaks on Flinders Island in 1842. The park was originally gazetted as a scenic reserve, covering 3,946 hectares, in 1935 for its spectacular scenery and wildlife values. In 1978 three parcels of land, with a combined area of 270 hectares, were added to the park (including Trousers Point), giving the park a total area of 4216 hectares. The national park was proclaimed in 1967 and given the official name of Strzelecki National Park in 1972. It is located at the southwestern end of Flinders Island (Flinders Island is situated off the northeastern tip of Tasmania, in Bass Strait). The park protects highly significant and diverse ecosystems as well as spectacular coastal and mountain landscapes. The park holds considerable scientific interest due to the high number of endemic species, rare flora and fauna and significant vegetation communities. Flinders Island is of particular significance as an important stopover point for birds migrating between the Australian mainland and Tasmania. Part of the text comes from Strzelecki National Park Management Plan.